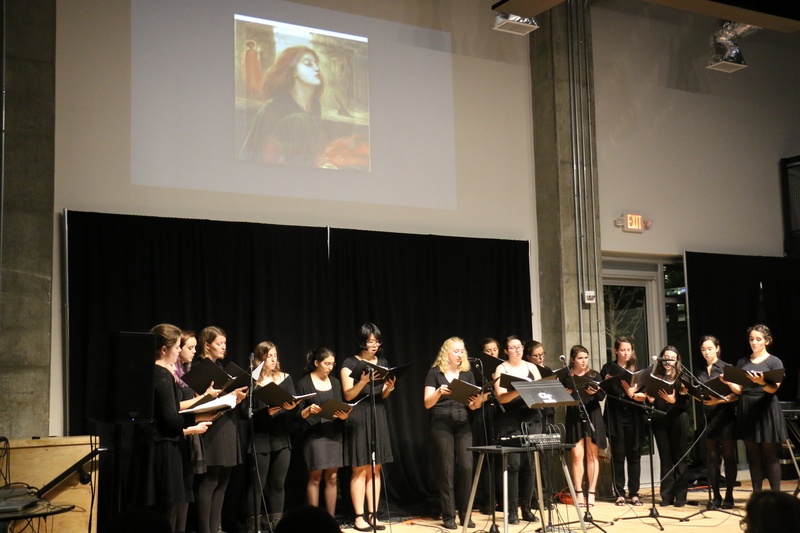 Women in Music Tech was proud to introduce its first ever event: a concert & reception on November 2nd, 2016 at the wonderful venue The Garage. This was a daunting task (we started organizing 5 weeks ahead only), but the outcome was satisfactory: the place was packed, we had a great evening, and even the Dean of the College of Design Steven French attended the concert. We are really thankful to the students, staff, and faculty of the music technology department for their wholehearted participation and incredible support! 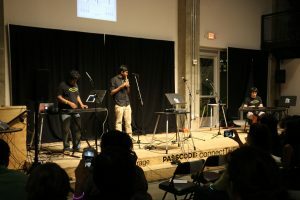 The idea behind this event was to introduce the world of music technology to the Georgia Tech audience. This is one of our four main goals at Women in Music Tech: spreading the word on campus about what we do at Georgia Tech Center for Music Technology (GTCMT) and thereby getting a more diverse pool of applications from undergraduate students. With this in mind, we had lightning talks from students in between the concert performances to give an overview of our research in music technology. We also wanted to collaborate with female students in engineering and music to engage them in music technology. We were delighted to work with the very talented Georgia Tech Women’s Choir and Nothing but Treble, the female a capella group on campus. All pieces were inspired by the influence of women in the field of music technology, be it by featuring female composers, female artists, or concepts introduced by female music technologists. The concert featured 7 performances and 13 talks, divided into 4 parts which correspond to our 4 labs: interactive system design, acoustics, music informatics, and musical robots. A piece from the international laptop orchestra OFFAL was also commissioned. After all this delight for the ears and eyes, the audience was treated with a wonderful set performed by Nikhil Bhanu, along with a nice buffet. 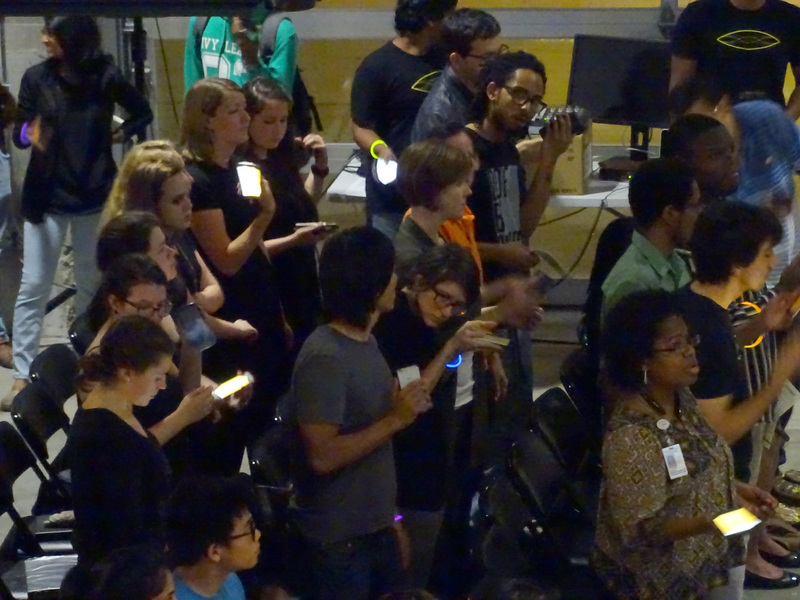 This performance explored a setting where the music was entirely created by the audience using their mobile phones, and there were no predefined hierarchies beyond the proposed interface. 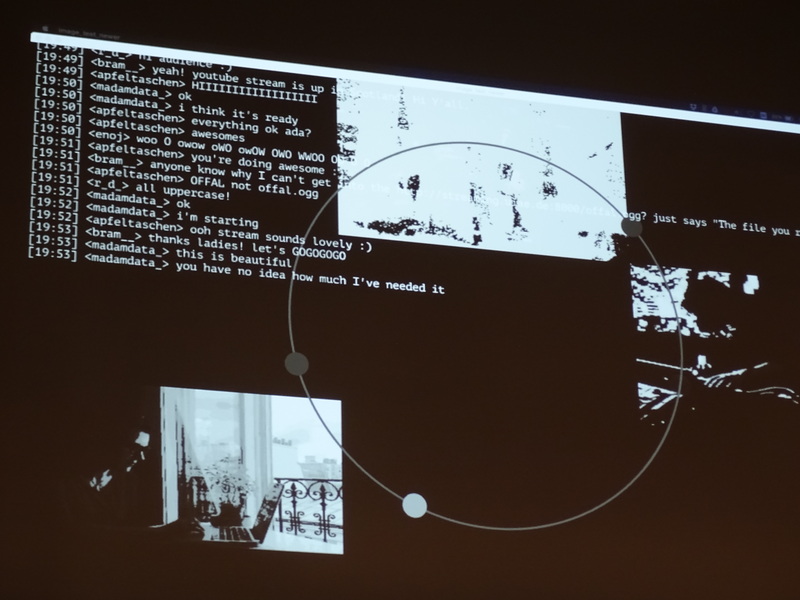 The piece was specified as a number of mobile accelerometer gestures that were recognized in a web application and triggered recognizable sounds. The piece explores the social diffusion of the discovery process. Figure 2: Do The Buzzer Shake. Photo by Valentin Baillard. Anna Xambó presented her work on tangible user interfaces (objects like sponges or wooden cubes that are computationally enhanced) and tabletop systems (interactive digital tables) for music performance and composition. 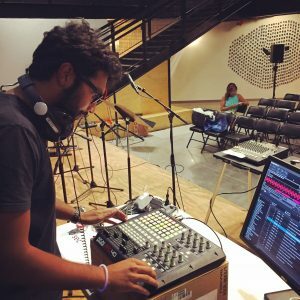 Nikhil Bhanu introduced his internship work on 3D audio (how to create sound tracks that sound “3D”), web audio (for online audio application) and live performances (for DJs to control their speakers). Kisna’s theme is an original soundtrack from the Bollywood movie Kisna. It is a flute-piano duet composed by A.R Rahman. The Center for Music Technology is a truly international research center: most graduate students come from foreign countries and add their own cultural diversity to the program. Figure 3: Krisna’s Theme. Photo by Tyler White. Milap Rane described his work on how to hide data in MP3 files, using audio steganography. Christopher Laguna talked about his work during a couple of his internships: at Google, he researched activity recognition (determine from a microphone if the user is driving, walking, or running), and at Dolby he wrote code for live streaming audio and video content. Léa Ikkache described her work in the EarSketch research team: EarSketch is a free online platform that teaches High School students how to code through music. This piece emphasizes on the need to reach a place where we see them meet. Our effort was to amalgamate the classical, traditional and experimental developments of various modes of music, to shout out our love for music, It’s love. 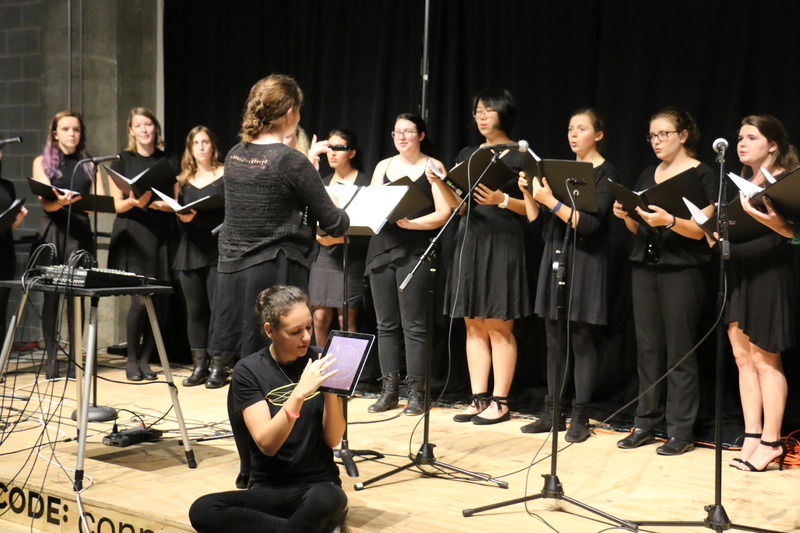 Sirish Satyavolu and the other music technology students found really interesting to work with Nothing but Treble, the female a cappella group on campus. Collaborations between music technology students and music groups in campus are still occasional, which is something which can be improved. Figure 4: It’s Love. Photo by Valentin Baillard. Brandon Westergraad presented his academic research in historical acoustics (trying to determine what the acoustics were in buildings that don’t exist anymore), and his work at the consulting group Newcomb & Boyd, involved in a number of building design projects in the southeast of United States. Jonny Wang introduced his research about vocal disorders: he analyzes audio recording of voices in order to determine if the patient is sick and this diagnosis can help treat anomalies faster and give people their voice back. OFFAL is an international collective of women laptop performers who devise performances involving multi-location collaborative improvisation. OFFAL performed with Union, an algorithmic collaboration system designed and programmed by OFFAL member Shelly Knotts. In this piece, the remote artists send audio streams from their locations to the performance venue to create a live collaborative improvisation. Union mediates the performers’ interaction by aiming to find ‘musical consensus’ in the incoming audio streams via music information retrieval algorithms. This data was used to mix and spatialize the incoming streams, and control the density of the overarching structure, according to the similarity of musical features including timbre and pitch content. Figure 5: Union by OFFAL. Photo by Valentin Baillard. Rupak Vignesh presented his work using machine learning to align the text of a song’s lyrics, with the corresponding music. Siddharth Kumar spoke about his work on sample detection i.e. identifying samples from one song which have been used in other songs. Thomas Weelkes was a composer of the renaissance period, who wrote many madrigals, which are sung without instrumentation. The Nightingale displays the artistry of his style and paints a musical image of many birds. The Women’s Choir voice was gradually altered by filtering effects (e.g. panning, buffer effects, and pitch shifting) using Ableton and an iPad application. Figure 6: The Nightingale. Photo by Tyler White. Takahiko Tsuchiya presented his programming interface for converting any data (like the temperature evolution during the day) to audio or music in a web browser. Avrosh Kumar showed his work that takes a painting as input and makes it come alive using a live audio signal. The performance used live recording of the choir and incorporated the sounds to create an outro section with accompanying beats and textures. The visuals used two paintings “Beata Beatrix” by Dante Gabriel Rossetti and “Burial of Atala” by Anne-Louis Girodet de Roussy-Trioson. Figure 7: Katrinah Josephina. Photo by Tyler White. Tyler White introduced the third arm project: a robotic arm for drummers, that plays along with the drummer, and adapts to the movement and music played by the musician. Hanoi Hantrakul presented his work on developing real time improvising algorithms and semantic understanding of rhythms for Shimon, the marimba playing robot. These are all for the upcoming concert with rock group Influx. Each of the buttons on the “MIDI Fighter”, a MIDI controller, played a different sound. Over the last few weeks, GTCMT recorded the Georgia Tech Women’s Choir and Hanoi used these vocal samples to create and perform a new remix! The DJ set consisted of music from prominent female musicians in electronic music. These amazing ladies are producers, DJs, composers and experimental musicians. Of course, there are many many more than the handful that were portrayed. However, it was an honor for Nikhil Bhanu to take this opportunity to showcase women’s contribution to electronic music. Figure 8: Nikhil Bhanu’s DJ set. Photo by Ashis Pati. 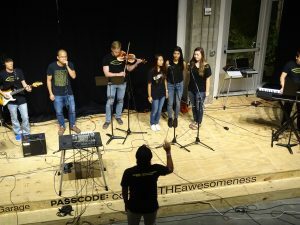 This concert was an attempt to spread the word about GTCMT and what music technology means across the campus community. It was a pleasure to see that the audience appreciated this tour of our world. We were also delighted to see an article published on the daily digest describing our initiative. We hope to attract even more undergraduate students in the audience next year! 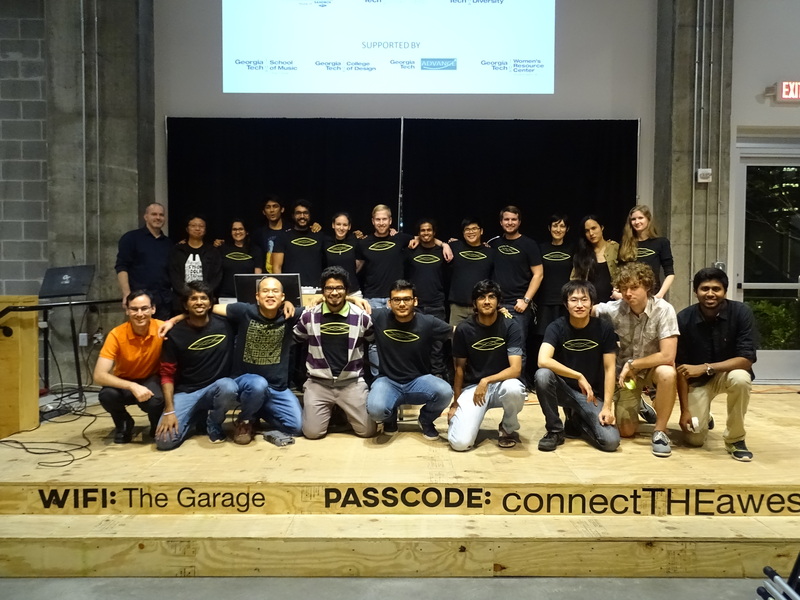 Nothing could have been done without the support from the School of Music, the College of Design, the Advance Program, the Women’s Resource Center, and Sandbox ATL -home of the Garage, so we warmly thank them. They really sent us the message that if you want to encourage diversity at Georgia Tech, Georgia Tech will provide you with the necessary resources to aid your initiative. In addition, we greatly appreciate the support of the Center for the Arts and Institute Diversity. Most of all, thanks to all the artists and the volunteers that spent so much of their time and energy making this concert a memorable event. We are particularly grateful to: Dean Steven French, Michelle Rinehart, Julie Ancis, Leslie Bennett, Madison Cario, Frank Clark, Nona Dowling, Ian Edelson, Archie Ervin, Mary Fox, Scott Henderson, Corissa James, Tim Hsu, Colleen Riggle, Catherine Ross, Joshua Smith, Gil Weinberg, Tyler White, and all the GTCMT student volunteers.